Chris Mundell has been announced as the Western Crows head coach for the 2019 AFL New Zealand Premiership season, a position he already once held back in 2017. Mundell was the head coach of the Northern Suns during the inaugural AFL New Zealand Premiership before moving to the Western Crows in 2017. Chris Mundell and NZ assistant coach Simon Black in April 2018. Having taken a step back in the 2018 Premiership season, Chris was the assistant coach of the Crows and returns to the top job ready to claim back the title in 2019. Just last month, the 33 year old Aucklander was named as the Head Coach New Zealand Senior team for the first time. 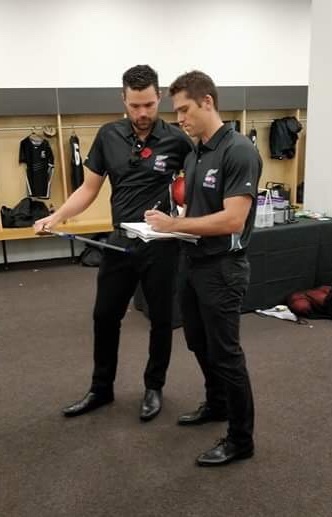 He spent the past three years as NZ assistant coach under Rob Malone along with his role as head coach of the New Zealand Under 18 side from 2015-2017.With over eight years of professional coaching experience, Chris Mundell has become a prominent figure within New Zealand’s AFL landscape. Initially entering into the AFL New Zealand High Performance Programme in an assistant coaching capacity, Chris has progressed to take on the head coaching role for the New Zealand Under 18 team, the Auckland Buccaneers at a National Provincial level and Auckland AFL coach with the University Blues.